Are you looking for a smaller SUV to make those commutes easier and stress-free? Are you tired of the same old, same old? Then do we have some news for you! Mazda, innovator of all things premium, has released the 2019 CX-3 and it looks better than ever before. 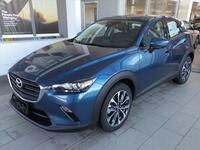 Smooth and slick yet unrefined, the newest CX-3 has much of what you loved before with some new features. Take a look at the 2019 Mazda CX-3 near Milwaukee WI! Let’s start with performance. The CX-9 has the same efficient SKYACTIV®-G 2.0L engine, but this time they’ve done a little work to make it better. It has upgraded power a little bit with 148 horsepower and 148 lb-ft of torque. While this difference from last year’s model isn’t much (146 hp and 146 lb-ft), you’ll now have access to the convenience of G-Vectoring Control. Take a look at some additional specs and features below! We’re excited to offer the 2019 CX-3 here at Hall Mazda in Brookfield. Conveniently located near Milwaukee, we’re your go-to for all things Mazda. Get the ride of your life and experience luxury without the luxury price tag here at Hall Mazda. Schedule a test drive today! Interested in a 2019 Mazda CX-3?